John Healey MP is worried that proposed tariffs on steel imports to the US could affect South Yorkshire expansion plans by Liberty Steel. The Wentworth and Dearne MP, whose constituency includes Liberty Speciality Steel's Aldwarke plant, wrote to Dr Liam Fox MP, Secretary of State for International Trade, setting out his concerns. US President Donald Trump made the tariff announcement last month which, if put in place, could have a significant impact on steel production across the UK. Set to be introduced last week, it has been confirmed that the EU, alongside Korea, Brazil, Australia and Argentina would be provided with a temporary one month exemption from the 25% steel tariffs. Whilst the decision to implement tariffs is based on national security considerations, the likely intention to increase US production by some ten million tonnes and reduce imports by a similar amount. The EU is the UK steel sector's biggest market but nationally 250,000 tonnes of steel was exported to the US in 2017 which amounts to £360m of exports. In his letter John said: "I am concerned that the planned 25% tariff could halt Liberty Steel's expansion plans. Time is running out. "It has been a tough few years for our steelworkers but with the sale of Tata to Liberty, and Liberty's plans to boost production and jobs, we were looking forward to more positive years ahead. "With the US a major market for UK steel, any tariff would have a significant impact and could be a blow to Liberty's ambitions to increase production. "A protectionist move like this will be detrimental to global trade and international efforts to tackle the root cause of the problem which is a global overcapacity in steel production." Dr Liam Fox MP, Secretary of State for International Trade, has said that the Government disagrees with the US decision to implement tariff based on national security considerations and that it has made clear the potentially damaging impact of tariffs on the UK and EU steel and aluminium industries. 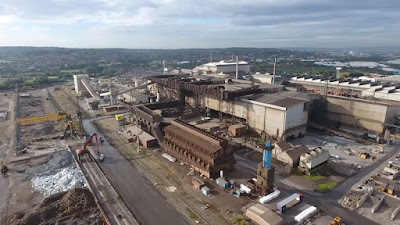 Exports to the US account for almost 12% of revenue for Liberty Speciality Steel in Rotherham and the introduction of a 25% tariff could mean the business would have to re-consider plans to increase exports to the US. Liberty formally completed a £100m deal to acquire the Speciality Steels division of Tata Steel UK last year. It is undertaking a multi-million-pound investment by the Liberty House Group – a member of the GFG Alliance - that is creating 300 new jobs at Rotherham and its sister plant in Stocksbridge.